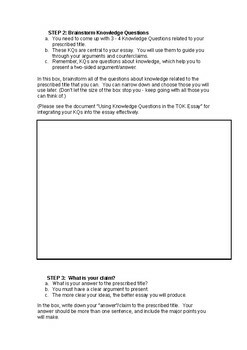 This document will help you guide your students through the entire TOK essay planning process. 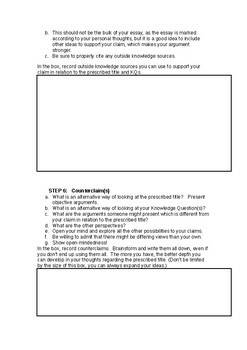 It covers everything from choosing the prescribed title, to KQs, claims, counterclaims, evidence, real life examples, perspectives, linking to AOKs and WOKS, and implications. 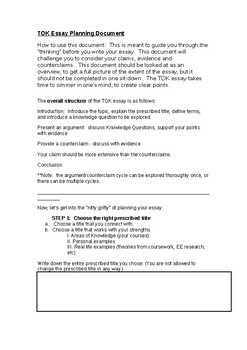 Help your students gain their highest score by helping them structure a clear essay fulfilling rubric requirements. Melissa Kendall is an experienced IB TOK and IB Economics teacher, and examiner, since 2008. Visit her website at MelissaKendall.org for more information and resources. 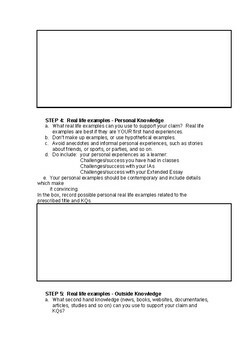 Coming soon: Hack the TOK Essay Rubric, Integrating Knowledge Questions in the TOK Essay, Video lessons on writing a great TOK essay.